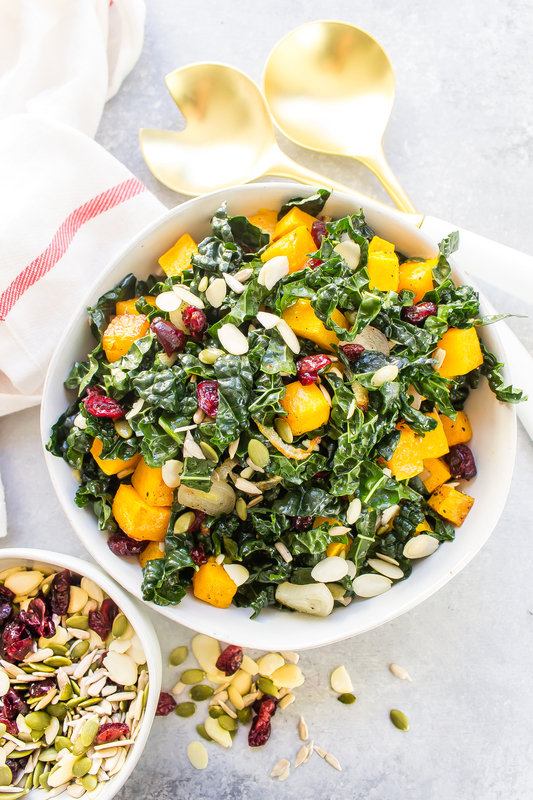 This Butternut Squash Kale Salad is packed full of nutrients and it’s bursting with flavor! It’s especially good with this Lemon Turmeric Chicken but is hearty enough to be eaten as a main dish. You’ll love the crunch and sweetness our Salad Fixins add to this Paleo salad! With only 5 ingredients, this is an easy recipe to throw together! Place the squash and the shallot on the baking sheet and drizzle with the 2 tablespoons olive oil, season with salt and pepper. Roast for 45 minutes until shallots are starting to caramelize and the squash is easily pierced with a fork. Remove from oven and let cool. Chop the kale into thin ribbons and place in a large bowl. Whisk together the dressing ingredients in a small bowl and pour over the kale. Massage kale with your hands for 1 minute to soften. Toss kale with the roasted vegetables and Salad Fixins and serve.